Now listen to this one, last July the insurance was due for the church. Chorel, who was the treasurer at the time, shopped around and found insurance that was $1,700 cheaper. Fantastic, one would think. Not so. The amount of hostility Chorel received on this one was quite incredible. Pat Cleary and Caroline Allen nearly did their nut as well as Rupert Taylor, the old insurance broker, screaming abuse at Chorel down the phone. 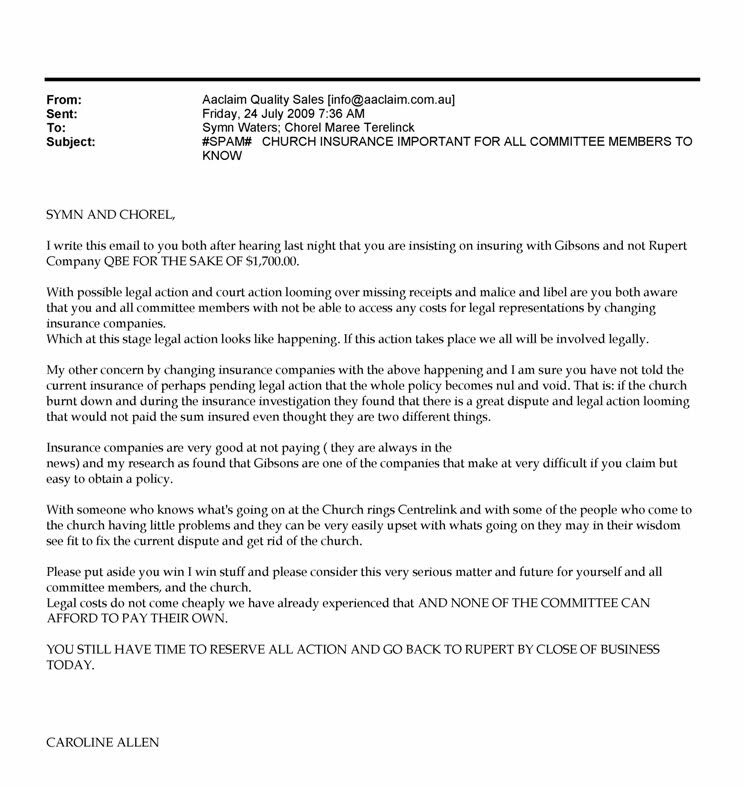 Here's a little E-mail that Caroline Allen wrote to Chorel and Symn complaining about the saving of $1,700. I believe Symn went straight to the police with this E-mail as it talks about someone burning the church down. Let's have a little look at the contents of this E-mail. Now why would someone complain about someone saving $1,700? Baffled!? So are we. A man even rang the insurance company pretending to be the church solicitor telling the insurance company not to accept the church's cheque. The church is running out of money and some people want more expensive insurance. Go figure!